Denison, IA. 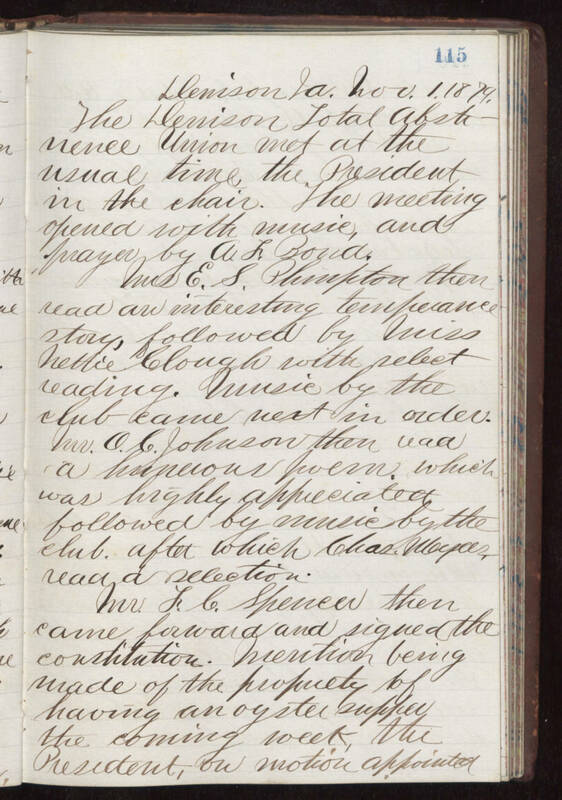 Nov. 1, 1879 The Denison Total Abstinence Union met at the usual time, the President in the chair. The meeting opened with music, and prayer by A.F. Bond. And E.S. Plumpton then read an interesting temperance story, followed by Miss Bettie Clough with select reading. Music by the club came next in order. Mr. O.C. Johnson then read a humorous poem, which was highly appreciated followed by music by the club. After which Chase Meyer read a selection. Mr. F.C. Shener then came forward and signed the constitution. Mention being made of the property of having an oyster supper the coming week the President, on motion appointed…..